Austin Peay State University is launching the state's first rotor-wing program. 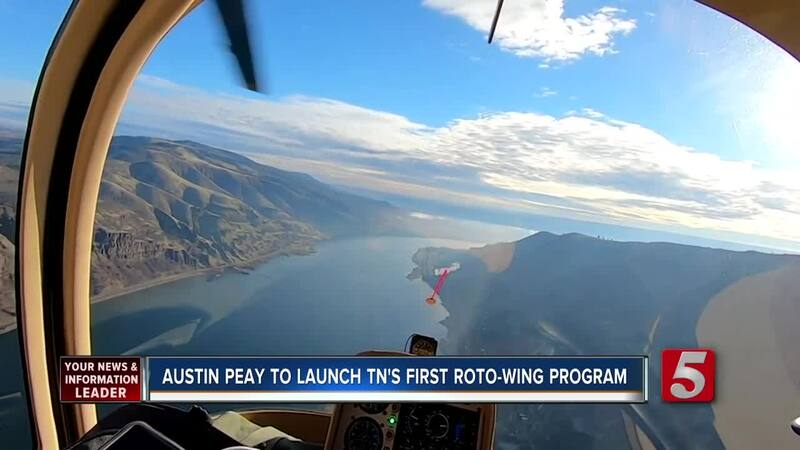 NASHVILLE, Tenn. — Austin Peay State University is launching the state's first rotor-wing program . "We're not only the only one in the state of Tennessee, but in every state surrounding Tennessee. There's only two other programs so this whole Southeast region is wide-open for rotary wing training," said Charles Weigandt, Program Director & Chief Helicopter Pilot at Austin Peay. A fleet of three helicopters will be housed at the Clarksville Regional Airport. Weigandt flew two of them in from the west coast. He says this is the perfect time to become a pilot. "The market for commercial pilots across-the-board, both fixed wing and rotary wing, is very wide open. The airlines are really hurting for pilots and as a result there pulling rotary wing aviators into fixed wing programs," he said, "So in addition to getting a Bachelor's Degree in Aviation Science, students will have the opportunity to graduate with their commercial flight instructor and instrument flight instructor certificates. Hopefully make them immediately hire-able in the job market." The degree requires more than 175 hours of flight time. The first flight lab will launch this Spring.